Near to Alexandra Palace-ideal for shows and exhibitions. Alexandra Palace Bed and Breakfast is situated in a quiet road, 5 minutes walk from Alexandra Palace. This small, family-run B&B has two rooms, one twin ensuite and a single with adjacent bathroom for sole use of guest. There are facilities for hot drinks in each room with complimentary biscuits and fruit. There are also cold drinks in fridge. A choice of full English cooked or Continental breakfast is available with homemade jams and honey from the garden. 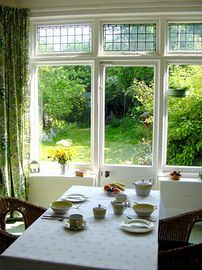 The breakfast room overlooks a lovely garden with bird feeders close to the house. Safe and friendly bees live at the bottom of the garden. There are parking spaces available in this residential road with easy access by public transport to central London. This is a non-smoking house. Single room with adjacent bathroom: £45.00 per night. Twin en-suite: £90.00 per night. Arrival late afternoon/early evening or other times by arrangement. Room to be vacated by 11.00am. Pet Facilities: Pets are not allowed. Smoking Facilities: Smoking is not allowed. Special Diets Provision: Special diets are catered for. Special diets catered for if requested in advance. Vegetarian and gluten free. Disabled Facilities: There are no disabled facilities. "Excellent stay,lovely room great breakfast, fantastic host." -TB 16/04/08. "Lovely,relaxing and very friendly. Thank you for making us so welcome C P 26/09/08. " You are made welcome and part of the family.All the fascilities are excellent and the service is A1 Who needs hotels? B P 08/09/08 "Another lovely break Thanks again S and S 05/10/08. "As usual, welcoming,warm and wonderful." - S+DE 22/06/06. "Superb hospitality and delicious breakfast." - R.C. 14/07/06. Nearest underground station Bounds green on the Piccadilly Line. 102 or 299 to Maid of Muswell pub and short walk up to the house. Alexandra Palace on the overground rail ,bus W3 or 184. Off North Circular to Muswell Hill, take Alexandra Park Road to Maid of Muswell pub. Drive up the Avenue, left into Vallance Road, then right into Elgin Road. No 4 is second house down from the top of the road on the left. If motor bikes are parked in the front garden please use the side gate past the hedge, up step on right to front door.